Upon entering TriBeCa’s Geary Contemporary gallery, visitors are greeted by a sprawling sculpture installed directly on the floor that is undefinable as a single being or object. Covered in scales and slathered in deep earthy metallic tones of blue, green, brown, and gray, this network of snake-like passageways forms an ambiguous landscape that looks as though it could have been sourced from the bottom of the sea. While the sculpture’s glittery facade may read as inviting to some, there is something deeply sinister and foreboding about it. Originally installed at the Bronx Museum for the Arts in 2017, The Primordial Molder by Heidi Lau invades this safe and finite gallery space with uncomfortable and enticing perplexity and possible danger. These feelings of uncertainty and impending doom are expanded upon throughout “The Sentinels,” featuring new and recent works by artists Rachel Frank and Heidi Lau. What these two artists share is an urgency to question the current state of the world through a series of artistic actions, installations, and reinterpretations of ancient cultures. Though each artist approaches their mediums in wholeheartedly different manners, their shared interest and ability to visually and physically express notions of change, history, and time allows new interpretations and narratives to emerge throughout this compelling dual-artist show. Frank, who works between sculpture, performance, and new media, creates a series of works that juxtapose rituals and artifacts of the past with new approaches and techniques. Most prominently displayed in the show are her “Pattern for a Yurt” panels, modern interpretations of felts that would be found in central Eurasian nomadic homes. 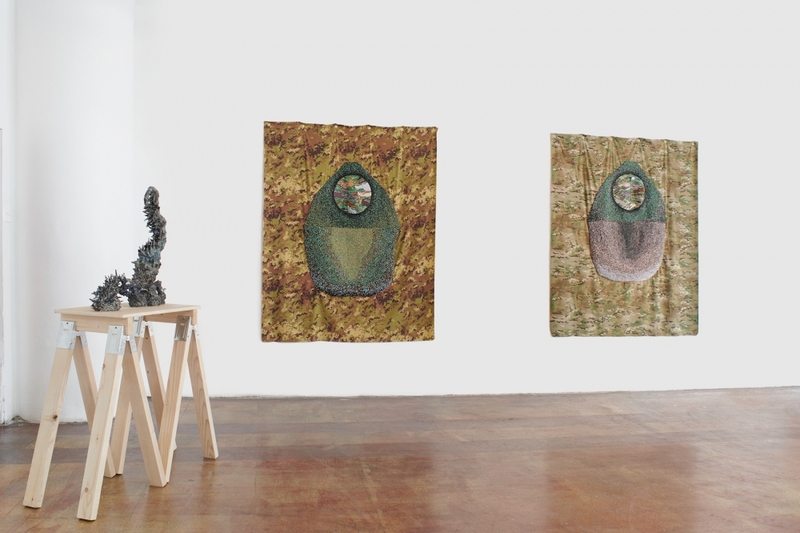 Green, brown, and beige camouflage tarps are hung directly on the gallery wall and are adorned with a bib-shaped designs made from hundreds of metallic beads, which have been hand-woven by the artist onto the fabric. These ambiguous beaded forms also resemble the outline of a metal vest from medieval armor, helping to connect Frank’s work to the show’s theme of visualizing notions of different types of guardians, both contemporary and historic. Less prominent but no less compelling is a series of four-legged ceramic animals atop a wooden table that have all been neatly decapitated. Organized into a miniature herd, these animals are either frozen in time or appear to have been vanquished mid-gallop, adding notions of movement and chaos. These objects also tie into ancient Eurasian culture: reinterpretations of “clay vessels that mimicked animal shapes and held liquids for use in ritualistic ceremonies to influence the gods,” according to the gallery. These items are also revisited in the artist’s video work, Vapors, in the gallery’s back room, which is not to be missed. Throughout the remainder of the exhibition are a variety of different ceramic sculptures by Lau, who has become a rising star in the art world over the last few months. This past March, she won the NADA New York Acquisition Gift, a collaboration between NADA Art Fair and the Bronx Museum for the Arts. In 2017, she received Triple Canopy’s prestigious commission that will result in a performance, created alongside Xiaoshi Vivian Vivian Qin, later this year. She will also participate in the Joan Mitchell Center’s AIR Program this year, where she hopes to realize sets and props for her upcoming Triple Canopy commission, as well as works for upcoming shows in 2019. In “The Sentinels,” Lau presents a series of ceramic sculptures that hang on the wall, sit atop wooden pedestals, or are installed directly on the floor. The works hung on the wall incorporate a series of elements from nature: leaves, frogs, snakes, hands, and peacock feathers. In particular, the feathers are meant to connect to the Ancient Greek idea that each feather’s “eye” is always watching and protecting, providing a sort of spiritual sentinel in the exhibition. Lau’s incredible aptitude for working in the ceramic medium is portrayed through these whimsical wall works, but also through her more rigid and threatening pieces from her aptly named works, Mountain of Knives. These foreboding, jagged creatures form a constellation of different hellish landscapes and are meant to portray one of the 18 levels of Taoist hell, which is clearly and concisely visualized here. The notion of a guardian implies that something needs some sort of protection or that danger is not too far away. This thoughtful collection of works provides a compelling narrative about the different threats to individuals or cultures that require some sort of defense, either physical or spiritual. Though Frank and Lau come from differing backgrounds and connect with the physical world using rather unique techniques, these works form a kaleidoscopic vision of what it feels like to live in a moment of uncertainty, and how lessons and traditions from the past might just save us.